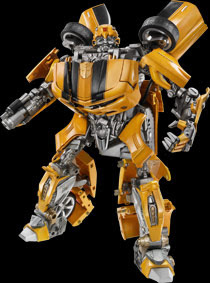 This Hasbro Bumblebee Transformer Autobot replica has been available in stores for a while now. With a price tag approaching $80.00 it isn't cheap. This large scale replica is a highly detailed interactive action figure, with lights, sounds and music it isn't your fathers action figure.